Commissioner Greg Hartmann says the budget shows a commitment to public safety, "which is, as always, our most important priority. Nothing happens without a safe Hamilton County. It also commits to the important progress made in the area of economic development. And I think that this budget certainly is a challenge." The Sheriff is getting $2 million more than what was budgeted last year and has agreed to kick in a million bucks from his reserve fund to bring his total up to $63 million, in line with what he's actually spent this year. Monzel thanks Sheriff Jim Neil for the help. "He's been willing to work with us, which is great," says Monzel. "We're not shutting down floors of the jail. We're not going to be laying off patrol officers. We're actually going to be hiring corrections officers to help ease that mandatory overtime that's at the corrections department." The budget doesn't include funding for a new crime lab. It does, however, direct the county administrator to draft a multi-year plan for making interim repairs to the current facility. Some funds are set aside to study how the county could consolidate operations and possibly off-load some county-owned buildings. The board is still considering accepting the offer of the former Mercy Mt. Airy site. There are several possibilities on the table for renovating the building and moving some county operations there but the county doesn't have the money to fund any of those ideas. The board is setting aside $281,000 for carrying costs on the building for two additional months while it considers the offer. That money will come out of the county's Capital Budget. 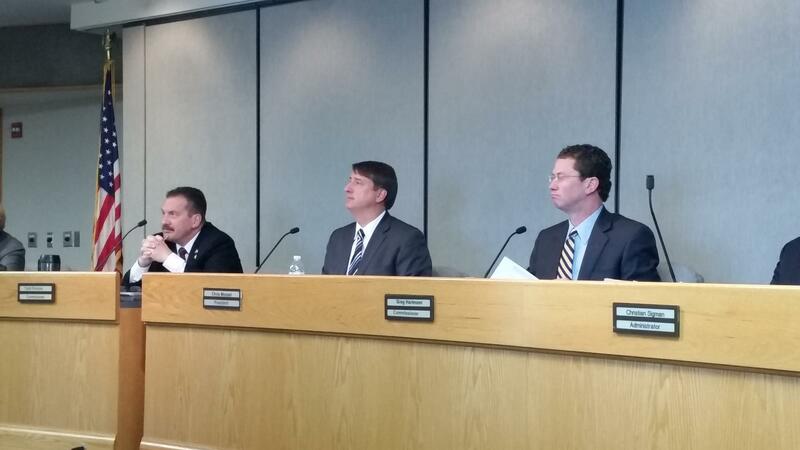 Commissioners approved the 2015 budget by a 2-to-1 vote, with Todd Portune dissenting. "I cannot support this," he says. "I think it's heavy on hope and light on reality in terms of being able to get through another year without the kind of cuts and reductions in service that are going to be felt throughout the organization and especially in the area of public safety." Portune had proposed a quarter cent sales tax increase paired with a property tax reduction. That plan was met with no's from the board's other two members. Monday he asked them to consider letting the public vote the sales tax idea but that, too, was shot down. In a separate action, the board set the 2015 stadium fund property tax rebate at the same partial funding level as this year. That vote was met with the same 2-to-1 outcome.